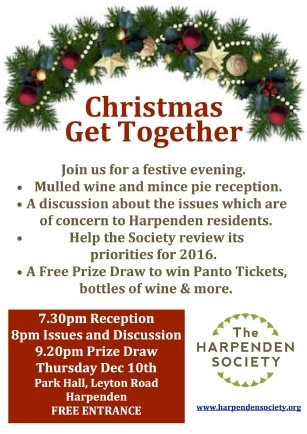 At a convivial pre-Christmas meeting of the Harpenden Society, after some seasonal consumption of mulled wine and mince pies, members were invited, in an open forum invigilated by society chairman Chris Marsden, to air their concerns about local issues. Among those taking part, in what was a free-ranging and sometimes lively discussion, was Hertfordshire County and Harpenden Town councillor David Williams. Not surprisingly, today’s nightmare car parking problems in and around the town became a priority topic among the 50 or so society members present in Park Hall. It was pointed out by several residents that on-street parking by commuters using Harpenden Station was ‘spreading’ ever further from the town centre. Clearly the fact that street parking was free had become a key inducement for those commuters willing to walk up to perhaps three-quarters of a mile to the station. But, even more critically, from Monday to Friday, the station car parks were often full to capacity. That was an issue which, said David Williams, had been recognised for a decade or more by Network Rail (NR) and by local authorities. He reminded the assembled company that NR had earmarked some £2 million back in 2013 for the erection of a ‘Meccano like’ double-deck structure on the east station car park. The plan, which would have increased parking capacity on that side of the station by about two thirds, required planning consent from St Albans District Council (SADC). And that was refused because of objections from residents in nearby Milton Road, even though the ground slopes steeply down from their back gardens, so that the proposed car park’s upper deck would be minimally intrusive. Some surprise was expressed at the time that NR deemed it obligatory to submit its double-deck car park plans to SADC, when it had gone ahead with construction of the new station footbridge - an eyesore to much of Harpenden’s population - having considered planning consent unnecessary. A separate problem afflicting the east station car park, that is the rush hour traffic and pedestrian congestion at its only (Station Road) entrance, was said to be under active consideration by NR and the local authorities. It was recognised that the situation could be eased by creating southern access to the car park, initially for pedestrians, via Crabtree Lane and Aysgarth Close. Cllr Williams recommended members of the Harpenden Society and others to keep lobbying SADC on all the planning-related station car park issues. One of those at the meeting suggested, as an alternative, or possibly in addition, ‘double decking’ Amenbury Lane car park, a proposal which would avoid the administrative complications of NR involvement, though posing a different question, namely how such a project would be funded. Other parking issues raised at the meeting included the contentious matter of the ‘school run’, where all too many parents, usually mothers, wanted to drop their children outside school gates in the morning and pick them up at 3 or 3.30 in the afternoon, creating horrendous congestion. ‘Let them walk or use the school bus’ is the perennial cry. But it was pointed out that those are not always practical alternatives, most notably in the case of working mothers wanting to drive their offspring to school on their way to work. 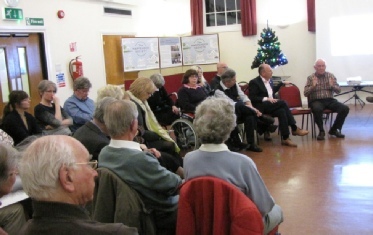 Several contributors to the discussion raised the subject of the conflict between motorists and pedestrians in the town centre. The concept of ‘shared space’, exemplified by the same-level - ie ‘kerbless’ - block-paved areas along Lower High Street, where the roadway and the footpath are separated only by intermittent black cast-iron bollards, was called into question. So too was the right-of-way priority, over pedestrians walking along Lower High Street, given to vehicles entering and leaving Vaughan Road, which conflicted with the allegedly shopper-friendly ‘shared space’ idea. No one at the meeting demurred from the suggestion that solid white lines across Vaughan Road, on either side of its crossroads with Lower High Street, would enhance pedestrian safety. Another pedestrian hazard raised at the meeting was that of cyclists riding on the footpath. Unquestionably against the law, it was something to which Harpenden’s rarely-seen police seemed to turn a blind eye. It was however acknowledged that cycling along the A1081 through today’s heavily-trafficked High Street brought its own separate dangers - for those on two wheels. The example of Holland as a ‘safe cycling nation’ was invoked, though Harpenden thoroughfares alas had no room to provide Dutch-style dedicated cycleways. The informal debate then switched to the Harpenden area’s urgent need for more secondary school places, which could only be met by building a new school. Cllr Williams said the site for such a school - currently designated Green Belt -on the corner of Lower Luton Road and Common Lane, had effectively been finalised as the only viable and practical option. Although alternative sites had been considered, landowners were reluctant to sell relatively cheaply for school use, when a much higher price could be realised with house building in prospect. Due to open in 2017, possibly in temporary buildings, the new secondary school would cater for children beyond just Harpenden itself, from Hertfordshire villages such as Kimpton and Ayot St Lawrence as well as, more obviously, from Wheathampstead and Redbourn. What was happening with the proposed redevelopment of the James Marshall home site behind the town hall? That was another question raised at the December meeting. Though the initial plans for an apartment complex submitted by the developer, Pegasus, were turned down, participating architect (and Harpenden Society member) Tim Riley, said they had now gone to appeal. Numerous arts and crafts groups in and around Harpenden, including for example the town’s local history society, had long agitated for a cultural centre which would be available for meetings, exhibitions and other related events. At the December meeting it became clear that funding was a key obstacle.